Combat Artist ~ Tom Lea Lived to Paint Another Day! After just completing my 30” by 40” oil painting of a battle scene centered around a 16th century Galleon, The Intrepid, my brother-in-law Scott gave me a wonderful gift. He gave me a book entitled The Two Thousand Yard Stare all about the artist and writer Tom Lea. Scott is a World War II buff and knows more about WWII than anyone else I know. He was in my 10th grade History class when I met him (he could have been teaching the class). He’s been center stage at family dinners for years telling the family all about WWII battles, concentration camps, Medal of Honor winners, statistics etc…. Scott bought this book about Tom Lea at the US Marine Corps Museum in Quantico, VA on one of his family visits in honor of his dad, my father-in-law Bruce T. Wallace, a Marine Corps Captain during the Korean War. Scott and I both have a tremendous sense of pride in our country and respect and honor for those who have served. My dad was a glider pilot in WWII and my mom was an Army/Air Corps flight nurse in the Pacific. This book is full of images drawn and painted by Tom Lea, accompanied by his personal journal of his first hand account of being on the frontline in such places as Guadalcanal on the aircraft carrier Hornet before it was tragically sunk, and at the fierce battle of Peleliu. 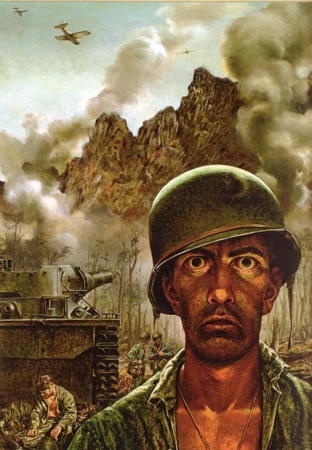 Tom Lea was hired by Life Magazine to capture and report back to the mainland what was going on at the frontline through his paintings. He somehow managed to survive all of his many assignments without carrying a gun, only his pencil and sketch pad! His work has amazed me. I thought I’d share with you art lovers a few images of Mr. Lea’s work that I found exceptional. This portrait of Maj. Gen. Claire Chennault is Andrew Wyeth-like in how expressive the features are on this chiseled warrior’s face. This painting of a flying cadet named Bill Kelly intrigued me. The difficulty of portraiture, the interesting perspective, the level of detail, the transparency of glass, the feel of leather and the look of metal are all handled brilliantly by Mr. Lea. Perhaps my favorite painting of his is this one of fighter pilot A. C. Emerson defending the aircraft carrier Hornet. Mr. Lea was on the Hornet, knew the men, and had experienced aerial attacks by the Japanese (as the Japanese fighters followed the US fighters back to the Hornet seeking payback for the damage the US fighters had just caused). I love the colorful composition, the lights and darks, the shadows cast and the stories told in this painting. After completing my painting of The Intrepid, which was full of symbolism, I could really appreciate this magnificent painting. Finally, this painting entitled The 2000 Yard Stare (the cover of the book) captures “the effects of war on the human psyche”. Mr. Lea was able to capture it all so well because he lived it and experienced it up close and personal. Thank you to my brother-in-law Scott for giving me not only the book but for making me aware of Mr. Lea’s artistic contribution to the art world and to our country. Mr. Lea passed away in 2001 but his art will live on forever! For further information on World War II combat artists a book entitled They Drew Fire –Combat Artists of World War IIwritten by Brian Lanker and Nicole Newnham is a great resource. For information on World War I combat artists a well-written and detailed book entitled Portrait of War by Peter Krass tells all about the U. S. Army’s first combat artists.